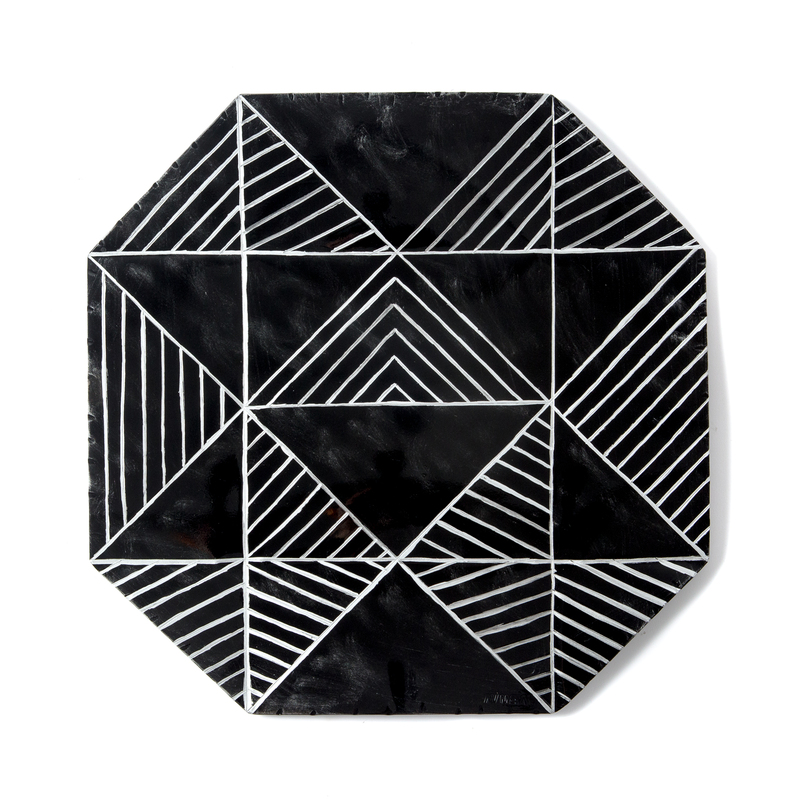 This hand-engraved and decorated steel plate is inspired by the sole textile motif, interpreted by artist and designer Eugenio Tavolara for the weavers of Sarule and made by AV Metal in different objects. 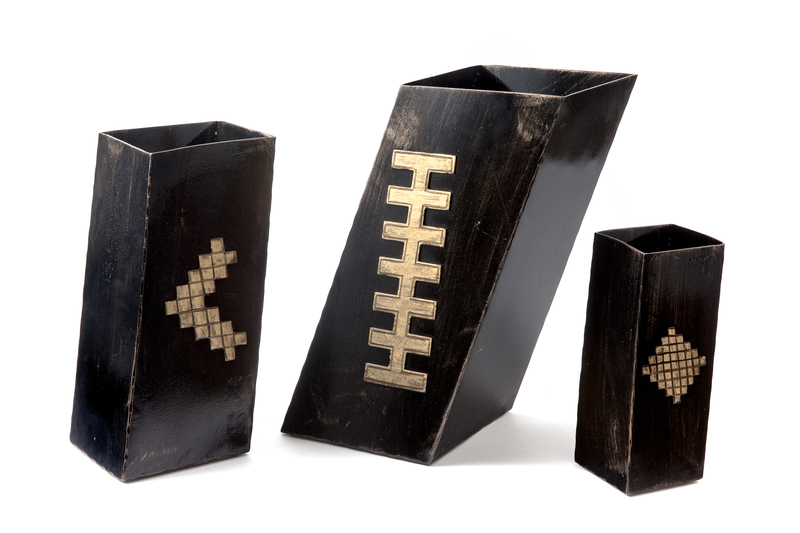 These decorative painted iron vases are original and of great aesthetic value. They are characterised by the tilted experimental forms and the decorations that recall the weaving patterns of Sarule. 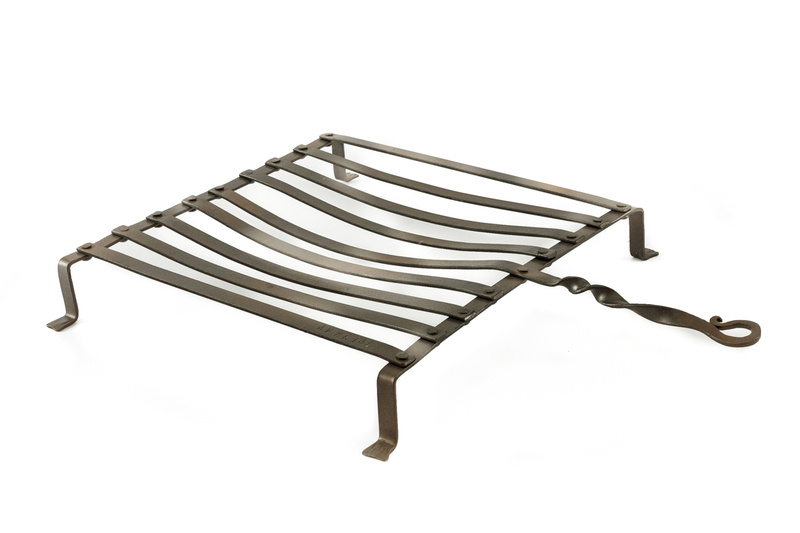 This original hand-forged tray is inspired by the shape of a traditional grill. 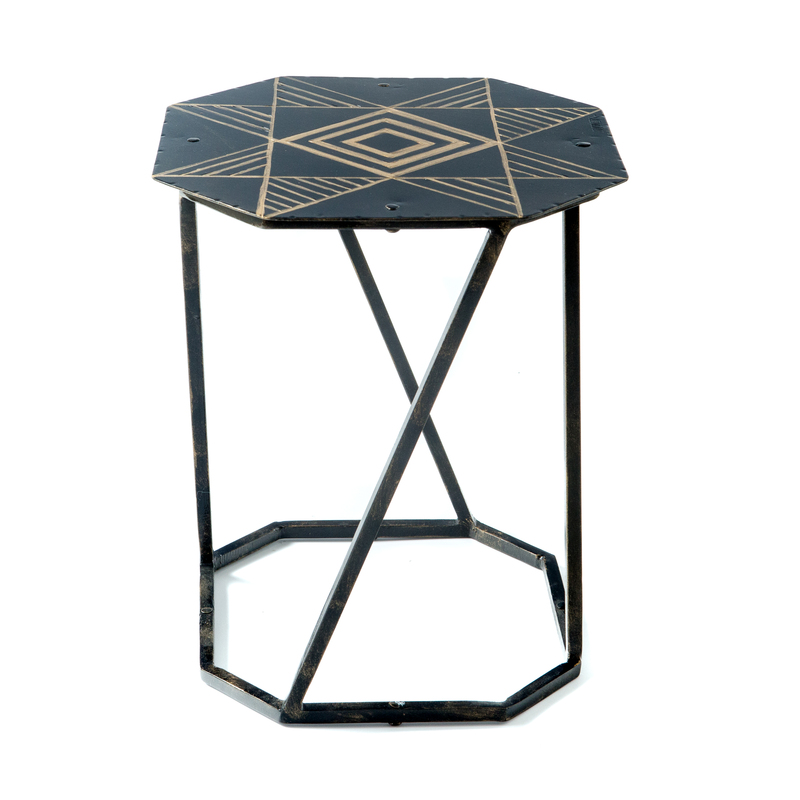 This iron stool painted in black and gold, characterised by clear-cut essential lines, bears the typical star taken from the weaving iconography of Sarule on the seat. It is part of the line of Tessili (textile) stools, that have ever-changing decorations. 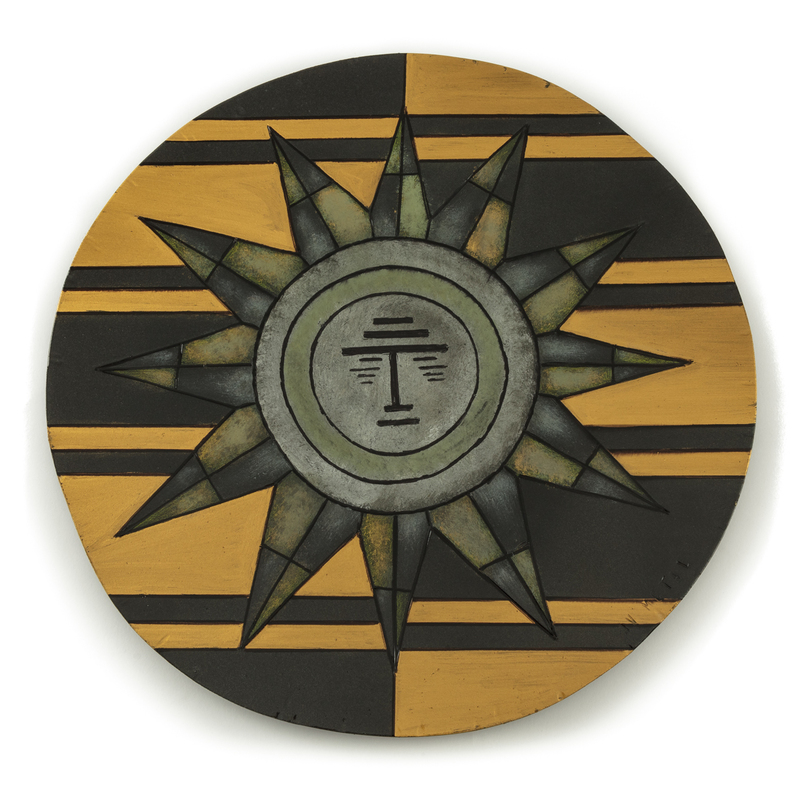 These decorative plates and trays in painted iron, with geometric and essential shapes, are decorated with stars and suns taken from the weaving iconography of Sarule. They are part of the line of Tessili (textile) plates, ever-changing in their original shapes and decorations. Av Metal was founded in 2009 to promote ancient craft traditions handed down through generations. Run by brothers Alessio and Antonello Vilia, its works are remarkable, inspired by local history and traditions. The metal working processes combine traditional techniques with the most up-to-date procedures and tools. They manufacture a wide range of hand-crafted artefacts, mainly made of wrought iron: objets d'art, furniture, windows and architectural elements which furnish and decorate indoor and outdoor living spaces. Over the years, this business has developed and consolidated in the craft industry for its ability to offer customers tailor-made products, and its care for details and finishes. This craftsmanship strongly marked by the influence of the textile tradition of Sarule and its peasant's tools, offers several collections, including pieces made entirely by hand, in both moulding and decoration. The company also manufactures custom wrought iron for home interiors and exteriors. The work is carried out based on projects made with different metals, iron shaped heated in a forge and hand-shaped, stainless steel, copper and brass, which are assembled and decorated. Wrought iron elements are associated with the other traditional techniques: forging, burnishing and engraving.